It’s officially the festive season in Marble Arch – that time of year when the office dos, store sales and pre-party pampering begins. With so much to see and do in the area, we’ve specifically selected the most festive stops, shops, salons and soirees in the area to make sure you fully embrace the season, indulge in the joy and treat everyone on your list – including you! On Thursday 22 November from 6–8pm, you’re invited to the Connaught Village Christmas Shopping Evening featuring deals and events by over 45 independent shops and restaurants. Plus, the Connaught Village lights and surprise roaming entertainment for adults and children alike! Enjoy complimentary refreshments, carol singing and interactive workshops starting from 6.00pm. Even better, the evening will be supporting local charity COSMIC (Children of St. Mary’s Intensive Care). Reclaim your Lunchbreak every first Thursday of the month, including 6 December, with the festive First Thursdays on Seymour Place, which will bring a bespoke line-up of special promotions, workshops and activities to the street to help local workers improve well being and enhance their relationship with the local area. Retailers Taliare and Lemongrass Boutique Spa will be offering exclusive discounts, Enjoy a complimentary drink at The Gate when you order from the lunchtime menu, For leisurely lunches, upgrade your half pint of Peroni for a full pint at no additional cost at Bernardi’s, An exclusive price on The Portman menu and accompanying drinks, 10% off all food at Corsican pizzeria SANDY’S between 12.30pm and 2pm, Basque Grill, Lurra and tapas bar, Donostia will serve a complimentary cup of coffee or a glass of wine to all diners during lunchtime service. On Thursday 13 December, dinner guests at Stuzzico in Connaught Village will enjoy a complimentary performance of classical singing by the extraordinary Nancy May. These events are very popular so booking is recommended. Book online or by calling 020 7262 9122. Rob & Nick Carter are featuring their new exhibition ‘Touching Shadows’ with Colin Glen. The pieces feature photograms of wire detritus. The array of 12 broken and discarded objects were now transformed into evocative shadow imprints. In 2017-18 the artists collaborated to harness a huge walk in Camera Obscura to produce a series of unique works on a larger scale. No negative or transparency is used in the making of the work. It is photography in its purest form, spinning ellipses of wire objects, a lens and photographic paper. Captured with a very narrow depth of field the resulting photographs are ethereal like ‘drawings in space’ that conjure up an astonishing combination of incredible detail and painterly lines. A crown in the jewel of Marble Arch, Lanes of London is a 5-star eatery that is truly luxurious and a stone’s throw away from tranquility of Hyde Park, merriment of Winter Wonderland and shopping on Oxford Street. Lanes of London is the perfect place to indulge in a Festive Feast with their various menus fit for any budget and appetite or thirst. Pamper yourself with the Festive Tasting Menu which offers an amouse bouche of fois gras ficelle, a expertly crafted selection of starters, main events and desserts to choose from, as well as paired accompaniments of mulled wine granita, eggnog pannacotta, mince pies and a cheese course option all for £59. Enjoy the paired back, but plush Winter Warmers for £35. Luxuriate in the gorgeous and renowned Festive Afternoon Tea, a timeless favourite with Christmas cheer included. Finger sandwiches get a merry make over, scone fit for Santa like Chrismas pudding and orange scone with mulled wine jam, pastries that double as presents for their positively plush tastes and dashing desserts, like cranberry, baked apple and cinammon macaroons, seal your perfect day with a bow! £28.50 or with a glass of Champagne for £40.50. Lanes of London is also offering outstanding Christmas Day, as well as New Years Eve menus for the righteous and revellers alike. 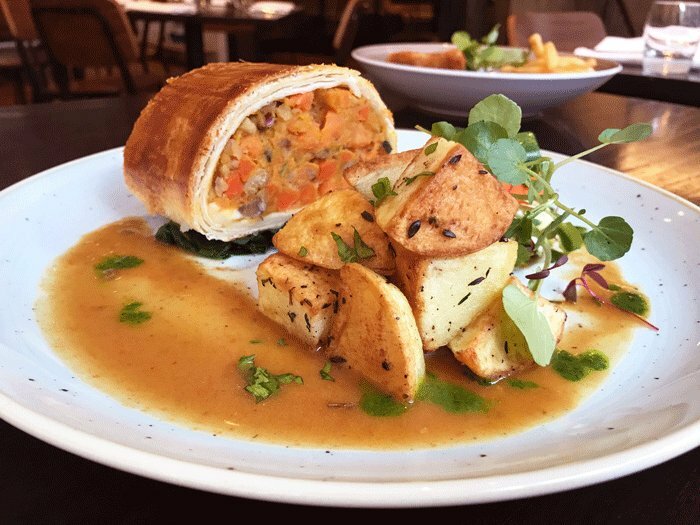 Consistently voted one of the best vegetarian and vegan restaurants in London, The Gate Marylebone has a special 3-course festive menu for £35.00 including Christmas crackers & petits fours for you and your guests. The meal includes starters like Wild Mushroom Vol-au-Vent with truffle oil, rocket salad, creamy leeks, mains including Butternut & Sage Wellington with leeks & roasted chestnuts, served with a cep reduction sauce, new potatoes & sauté kale, and desserts like gluten free Chocolate Snowball – a dark chocolate shell filled with chocolate mousse & griottines, served with Chantilly cream & dark chocolate sauce. Want more of where that came from? Check out their 5-course New Year Eve tasting menu . The chefs at Vinoteca have been working hard to create some truly outstanding Christmas Menus! We love the 3-course £40/person features seasonal favourites and an Italian twist plus wine pairings to suit every budget. Plan ahead and book your office Christmas lunch, family get together or festive dinner with friends in one of their beautiful private rooms. Email privateroom@vinoteca.co.uk or call 020 3544 7406 to ask for availability & full info. The Larrik is not only a cosy pub, but an amazing restaurant. Their Christmas menu is no different with either 2-courses for £26.50 or 3-courses for £32.50. They have vegan options alongside modern classics, such as full Christmas lunch, orange and cinnamon creme catalan with almond shortbread. A whisky lover’s paradise in the heart of Marylebone, with the best BBQ this side of St Louis. 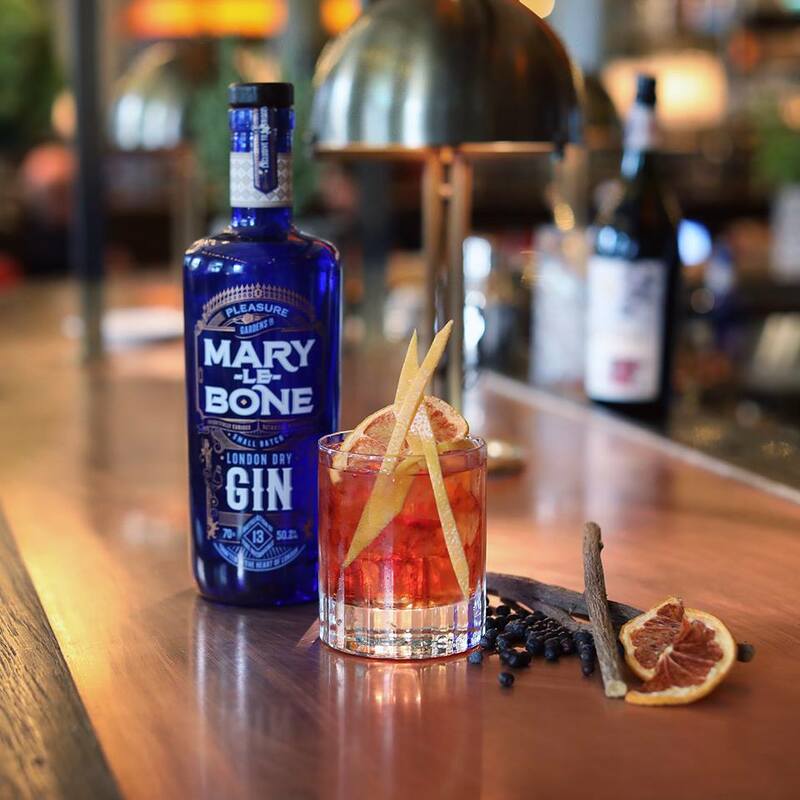 Lord Wargrave is perfect for all kinds of festive occasions, from intimate gatherings to office parties. View their Christmas menus with 3-courses for £28 including starters like goats cheese, pear and winter leaf salad with elderflower dressing, nearly fill-up on south coast fish pie with winter greens and finish off with chocolate and hazelnut brownie or Colston Basset stilton and Quickes cheddar, jelly, grapes and crackers. To find out more about New Year’s Eve private hire call 0207 723 0559 or email contact@lordwargrave.com. Indulge in a very special Christmas menu, as well as New Years Eve, at The Portman. Their upstairs restaurant is stunning with world-class food and wine. There’s something special for everyone whether you like traditional turkey and trimmings or a little difference. The Christmas menu features Seared Diver Caught Scallops, Butternut Squash Puree, Black Pudding & Sage Butter (g/f), Homemade Wild Mushroom Ravioli with Tomato Sauce, Pecorino & Rocket (v) or Thai Turkey Curry, Jasmine Rice & Pak Choi (g/f), Chocolate Mocha Tart with Crème Fraiche and Raspberry. London Grace is London’s go-to destination for nailcare with a dose of coffee or cocktails on the side. They have some extra special Christmas events to coincide with their new festive hues. Celebrate the season in style with the London Grace limited edition Christmas Afternoon Tea, served in their private ‘Grace Space’ party room (available for 7 or more guests). 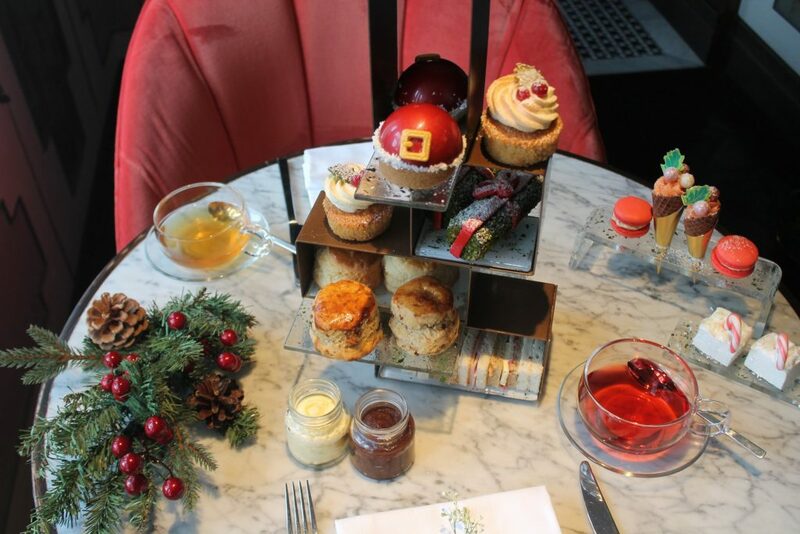 London Grace’s popular Afternoon Tea has been given a yuletide twist with a selection of sandwiches, Christmas themed cakes, fruit scones with cream & jam, a glass of prosecco and teapigs tea. Once everyone has had their fill of cakes and fizz, guests can sit back and enjoy their chosen manicure or pedicure treatment. London Grace also have the entertainment covered, with a Christmas quiz and festive themed photo props. There’s no room hire fee and they’ll be a dedicated Events Host on hand to look after the party guests. The Christmas Afternoon Tea is only £28pp – plus the cost of the chosen treatment. For your tipple, LG has a winter cocktail menu created by Sipsmith, which can be enjoyed alongside their Limited Edition treatment menu of glitter accents and festive nail motifs. To add to the festive line-up, London Grace are also offering Christmas motif accents, so clients can add a scattering of stars or snowflake to their digits (£2 per nail). The winter cocktail menu includes a fizz favourite, the Sloe Royale (£9), a deliciously comforting Hot Gin & Gingerbread (£7) and a warming Mulled Sloe Gin (£7). Whether it’s for a party or a present, Buchanans Cheesemongers is your one-stop shop for all the cheese lovers on your list. As the main cheese supplier to London’s top restaurants, Buchanans has the most delicious cheese from the very best producers in the UK and Europe, which they tend to in their cellars so that it may be enjoyed in the best condition possible. They also offer personalised, informative cheese training sessions, either at their London Cheese School or they can come to you. Don’t let a free-from diet restrict your Christmas indulgence! As Nature Intended has you covered with various free-from, vegan, veggie and clean goodies including advent calendars, stock fillers, skincare and make-up, wine and ingredients for your Christmas lunch. Dress up the special man in your life at Taliare, London’s most personal tailoring house, offering a full bespoke and made-to-measure service in the finest tradition of Savile Row style and craftsmanship. They offer an extensive range of shirts and suits, jackets and blazers, evening wear, morning coats and shooting clothing, exquisitely made and at compatible prices. Whether you opt for the bespoke or made-to-measure service, owner and founder Erlend Norby will work with you at each stage to ensure your complete satisfaction. This luxury skincare boutique showcases a wide range of indulgent but affordable face and body masks from a unique Korean-British team. Vitamasques is dedicated is delivering pampering treatments to hydrate, replenish, refresh and revitalise your skin, while remaining free from parabens, mineral oils and sulphates and animal cruelty.